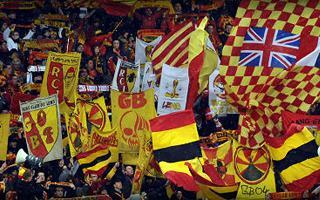 France: Lens return in great numbers! One of France’s most popular teams are coming home. This doesn’t mean Stade Bollaert-Delelis is entirely ready after redevelopment works, but it’s operable to the point that viewers may be allowed inside. Having spent entire season at Stade de la Licorne (and three games at Stade de France), Lens fans are clearly enthusiastic about returning home. Opening game on August 8 is against the Parisian Red Star. Even though the Lens were relegated to Ligue 2, supporters aren’t letting go of their team. Today the club announced all tickets have been sold out 4 days before the actual fixture. This means we may expect some 32,000 fans on Saturday. Eventual capacity will reach 38,233 people (decrease from 40,000+), but until all works end some areas are not available. Reconstruction of Stade Bollaert-Delelis will last until the end of 2015, ending half a year before Euro 2016. The project focuses on providing new roof (without view-obstructing pillars and covering everyone better) and expanding infrastructure for regular and corporate visitors. Altogether it’s expected to cost around €70 million ($77 million).